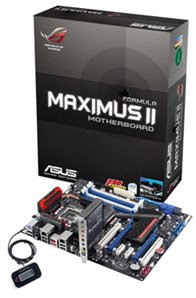 ASUS a lansat noua serie de placi de baza ROG Maximus II Formula bazate pe e chipset-ul Intel P45. Placile de baza din aceasta serie ofera o experienta audio desavarsita prin intermediul placii de sunet SupremeFX X-Fi. In plus, sunt incluse tehnologiile CPU Level Up (pentru overclocking dinamic al procesorului) si Extreme Engine power design (ce asigura tensiuni precise pentru stabilitatea sistemului). Pentru alimentare sunt disponibile 16 faze pentru CPU, 3 faze pentru northbridge si 2 faze pentru memorii. The Republic of Gamers (ROG) is dedicated to delivering unsurpassed gaming experiences for the serious gamer. In the ROG Maximus II Formula, the bundled new SupremeFX X-Fi audio card provides gamers with life-like sound effects and 3D surround sounds to fully immerse them into their games. With an emphasis on high quality design, the Supreme FX X-Fi utilizes the ADI 2000B audio codec, Creative X-Fi suite, CMSS3D and Crystalizer technologies, and authentic EAX sound effects to produce top-notch virtual 3D surround sounds to bring gamers one step closer to “being really there” in their games. ASUS’ legendary engineering prowess has culminated in the new ROG Extreme Engine – a next-generation multi-phase power design that provides additional overclocking headroom for extreme user experiences. Comprising of a 16-phase power design for the CPU, 2-phase for memory and 3-phase for the north bridge; Extreme Engine will provide users with additional voltage options in the BIOS for higher performances. With only the best quality components used, stable power to components provides reliable operations; while a power efficiency of up to 96% and automatic power management ensure less energy is wasted and less heat produced – allowing gamers to enjoy the most stable potentials for the ultimate gaming experience.